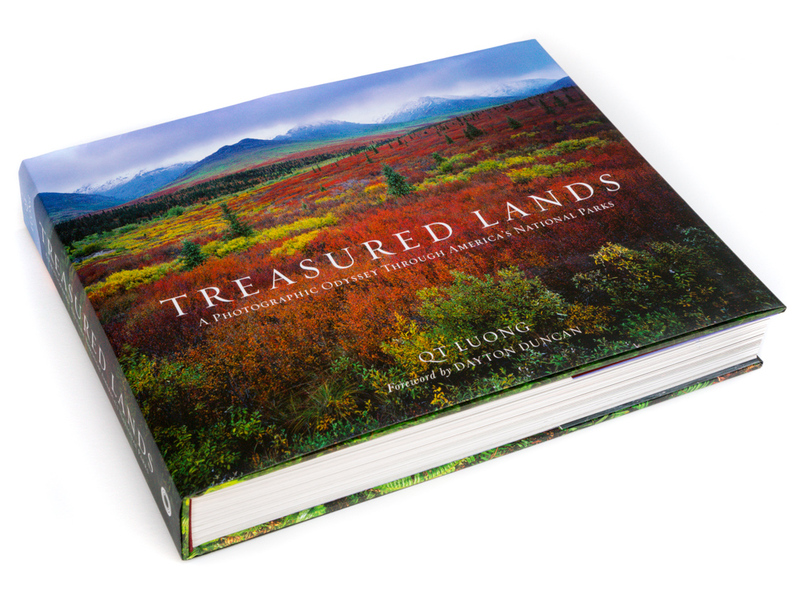 This new book by Q T Luong, a photographer featured in Ken Burns’s series, The National Parks, is a glorious birthday present to help us celebrate our park system’s centennial year. Back in 2009, I (like many others) was completely swept away by Ken Burns’ magisterial series, The National Parks: America’s Best Idea. There were so many admirable parts of the series, but two things in particular have stayed with me. First I was how it humanized the parks—it wasn’t just a 12-hour collection of gorgeous images, but a study in how we’ve thought about, and even fought about the parks. Along the way, it focused attention on the long and distinguished line of thinkers, writers, and photographers who have helped us understand these natural treasures and what they mean to us, such as John Muir, Marjory Stoneman Douglas, or Ansel Adams. The series brought us face to face with these luminaries, giving us a chance to get to know our National Parks through their works. The other point that resonated with me was how skillfully the series told the story of ordinary (and not so ordinary) people who were completely transformed by their experiences in the parks. People like Stephen Mather, or even Teddy Roosevelt himself, wandered into these natural wonderlands at some critical point of their lives… and never really left. In seeing these transformations, we were transformed ourselves. Toward the end of the program we were introduced to a person who embodied both these ideas: photographer Q T Luong. Mr. Luong was a relative newcomer, someone who was first drawn to the parks in the early 1990s; but once he experienced them, he too was hooked. More than that, he was moved to capture the essence of the National Parks and share them with a larger audience… to transform how we saw them. Inspired by the long tradition of American landscape photography, he decided to embark on an unprecedented, multi-year project to photograph all the national parks with a large-format camera. Stephen Sondheim’s Sweeney Todd: The Demon Barber of Fleet Street is considered one of the greatest—if not the greatest—musicals ever written. This is quite a twist of fate; by most conventional measures, there are few shows that seem less destined for success. When it opened the show was completely unconventional, with a blood-drenched storyline that seemed ready-made to send audience members racing for the exits in horror. It is not surprising that its original Broadway run took a sizable financial hit, and its original London run fared even worse. Yet the show didn’t die a quiet death after its Broadway closing, but rather jumped from greater to greater success. Over time, audiences adjusted to the idea of a musical in the horror genre, and came to appreciate how boldly Sweeney Todd shattered convention and redefined what a musical could be. After repeated listens, music lovers fell under the spell of the score’s limitless depths and marveled at how Sondheim was able to create and build a sense of relentless tension that lasted through the final chord. Audiences also came to rally behind the deliciously complex characters—characters who are almost devoid of any redeeming value but are just too mesmerizing to stop watching. Plus, there is the greater appreciation for the hilarious moments of dark comedy, which paradoxically release and tighten the underlying tension. We’ve finally caught up to Sweeney Todd’s brilliance. The show is… well, a perfect musical feast. And from the moment I first saw it (strangely enough, while I was in the seventh grade), I have unabashedly loved it. Girl Friday, a stellar theater company based here in Minneapolis, is finishing up its run of Thornton Wilder’s The Matchmaker this week. Given that time is running out, I wanted to provide a quick review so that you still have a chance to see it before it closes. Over the past weekend, I had the very good fortune of performing Verdi’s Requiem with my friends and colleagues of the Minnesota Chorale and Minnesota Orchestra, under the baton of Roberto Abbado. And without further ado, let me say that I absolutely loved it. It was one of those wonderful experiences where a great piece of music, a great conductor, a great group of performers, and a great audience come together to create a wonderfully satisfying whole. Together, we went on a amazing journey that touched us all deeply. Something amazing happened lat night at Orchestra Hall in Minneapolis. Was it a kick-off to a new season? The start of a new era? A fundraiser? Party?